We’ve been hearing about the Tesla Model Y, the crossover sibling to the Tesla Model 3, since all the way back in October of 2015. Three years later, it’s about to debut at 11 p.m. est. tonight. Here’s everything we know about it so far. Back in October of 2015, Tesla CEO Elon Musk fired off a series of tweets confirming that the Model 3 would be joined by a vehicle he called the Model Y. The original tweet was quickly deleted. 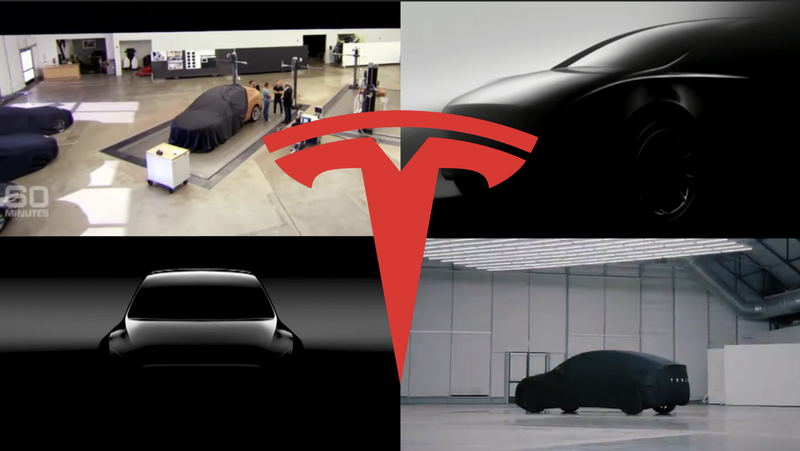 In January, 60 Minutes did a feature on electric automaker Tesla, and in one shot, partially covered by a sheet in the background, was a clay model of something that wasn’t a Roadster, a Model S, Model X, nor Model 3. It was a crossover, visibly smaller and seemingly less complex than the Model X. Soon after, Electrek got Tesla to confirm it was developing a second vehicle on the Model 3 platform. The Model Y name was seemingly chosen to complete the acronym “S.3.X.Y.” using the designated letter of each of the company’s models. Musk has repeatedly referred to the upcoming Model Y as a “small SUV,” designed to be smaller and more affordable than the Model X SUV. Unconfirmed sources initially claimed that the Model Y would be engineered with the same falcon doors as the Model X back in 2016, but considering the engineering struggles with the fancy doors, the Model Y seems more likely to get good-ol’ normal hinged doors. For years, there wasn’t much of a substantial update about the Model Y after its initial name announcement, as the company introduced the Model 3 in March of 2016 and spent most of its resources bringing that car to production. The first official teaser revealing pretty much nothing. Musk previously wanted to develop the crossover on an all new platform that would abandon the typical 12-volt battery architecture, which would help with various qualities of the vehicle, including cutting down production line resources for each individual car. But the problem with doing such a thing now would be the production overhead that would go into a completely new model and production process, when they could just use what they’ve done for the Model 3 as a foundation instead. In February of this year, a letter to investors revealed that the Model Y would share about 75 percent of its components with the Model 3, and that it would be about 10 percent larger in size. Musk also suggested that performance would take a bit of hit due to Model Y having more mass and higher drag compared to the Model 3, while sharing many of its components. We’ll have to wait until later tonight to get a better idea of how Tesla will shape each individual trim of the Model Y, but if it’s like the Model 3, we can expect a Standard Range, Standard Range Plus, Mid Range, and Long Range trims for rear-wheel drive models, and Long Range and Performance trims for dual motor all-wheel drive trims. Musk has also already revealed that the Model Y will be priced to be about 10 percent more expensive than the Model 3, likely across the board at each performance level. As for where Tesla plans to build the damn thing after famously struggling to meet demand for the Model 3, early reports indicated the company was stuck deciding between combining the Model S and Model X production lines into one at the Fremont factory and making room for the Y, or possibly setting up Y production at the Gigafactory near Reno, Nevada. Both the Model 3 and Model Y are expected to begin additional production in the new Shanghai Gigafactory once it’s operational. Production has already been said to start ramping up in 2020, will full production by the end of next year. For everything else, well we’ll just have to give it a few hours.